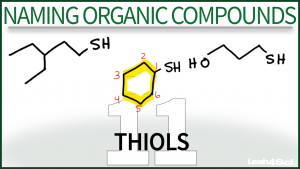 This tutorial videos takes you through the IUPAC and common rules for naming thiols or molecules containing an SH group. Examples include simple and substituted thiols, as well as mercapto-alcohol examples. This is Video 11 in the Naming Organic Compounds Video Series. Click HERE for the entire series. But Leah, I am confused about Thiol & Sulphanyl. Sometime you are counting SH with carbon saying thiol somethime not counting SH saying Sulphayl. How could I know which one is Thiol or Sulphany. How do you know what kind of subsituents gets higher or lower priorities in general? It comes with practice and knowing. You should have a list in your textbook of the substituents you have to know.